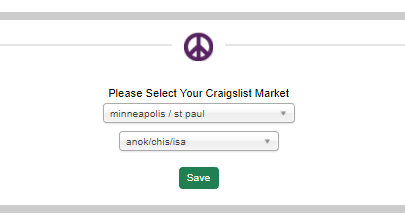 You can find the craigslist settings page by Clicking on the marketplaces, and then hovering over Craigslist, and then clicking on "Settings"
Once you've made your way to the settings page, you first have the option to select which craigslist market you would like to post to by default. From the craigslist dashboard you are able to post to different markets, this setting only sets the default posting location. In the second section of the settings page you have the option to to display the vehicle pricing in your ads, and the option to edit what location displays in the title of your craigslist ads. The option to change the title layout can be found here as well. The year, make, model, and sub model selections are made for you by default, but you are able to drag and drop these options into the order you would like them to display in. There is also a custom text section wherein you have the ability to add a custom string of text to the title of all craigslist ads. In the second section of the craigslist settings you have the option to use our photo templates. This section also contains the "Photo Count". This option indicates how many photos you would like to display in your Craigslist ads. We also give the option to skip any number of the first photos on your ads. This option is helpful if there is a photo with a water mark that you would like to not have post. In this section you will also find the "Upper Custom Content" and "Lower Disclaimer" sections. Any text written here will appear on every advertisement that is post. The upper custom content will be displayed near the top of the advertisement, and the lower disclaimer is displayed at the bottom of the ad. This section is helpful to customize all of your ads without having to edit all of your vehicles. The following section "Maps & Extras" allows you to decide if you would like to include a map showing your dealership's location, if you'd like to display the vehicle's VIN number on your advertisements, and which options you would like available to your customers to reply about your advertisements. In the "Posting Schedule" section you are able to specify which days of the week, and what time of day you would like to post. Each day of the week has the option to post in the Morning, Afternoon, Evening, or if set to None, it will not post at all on that day of the week. The following section "Smart Post Filters" allows you to set filters that choose what is automatically post. This section allows you to select if Used, New, or Certified Pre-owned should be post. You are able to select if vehicles can be post if they do not have a pricing, and you can also set a price range that will only allow vehicles that fit into that price range to be post. The option to delete advertisements for vehicles that have sold can be found here as well. The duplicate models option allows you to decide if you would like vehicles to be overlooked for posting if there is already a post containing that vehicle's model live on craigslist. The final section allows you to dictate the order that vehicles are chosen in. These tiles are "drag and drop" and can be ordered in a way that best suits your inventory. This section acts only to prioritize certain vehicles and will not exclude vehicles that do not fit under these classifications.